After nearly three weeks without air travel, Tununak might finally have a functional airport again. The village’s $19 million airport is less than a year old, but shifting permafrost had already buckled and potholed its runway; a third of it was starting to sink. Earlier this month, Ravn Alaska and Grant Aviation both refused to fly to the village, citing safety concerns. 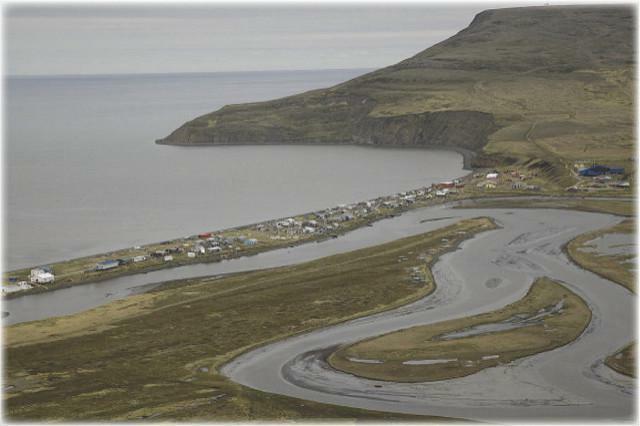 As the shelves at the local store ran empty, Tununak residents resorted to driving across the tundra on four-wheelers to Toksook Bay to pick up their groceries and mail. According to Department of Transportation spokesperson Shannon McCarthy, Tununak’s airport should now be fixed. A team of DOT grader operators flew to the village and graded the runway several days ago. Their emergency contractor unloaded rock, gravel and other materials from a barge in the village yesterday, which the team will use to further grade and smooth the area. Ravn and Grant have yet to respond to KYUK’s requests for comment, and it’s not clear if they’ve officially started flying to Tununak again, but at least one Ravn flight landed safely at the airport earlier this week. Tununak store’s general manager Gloria Kanrilak was on a Monday flight that was scheduled to land in Toksook Bay. She said that the Ravn ticket agent in Bethel warned passengers that the airline still wouldn’t be flying to Tununak, but once they were in the air their pilot took a look at the village’s runway, thought it looked safe, and got permission to make an extra stop. A second shipment of materials is expected in the village on Nov. 1 and McCarthy said that work on the airport should be completed by the end of that week. She added that the permafrost might shift beneath the runway again next spring.